A weekend venture, in this age of travel, can be one of our greatest commodities. To explore and personally experience new and previously unseen cities and landscapes of this world is becoming all the more possible - particularly as we learn how to make the most of our precious (but limited) time at the weekend... 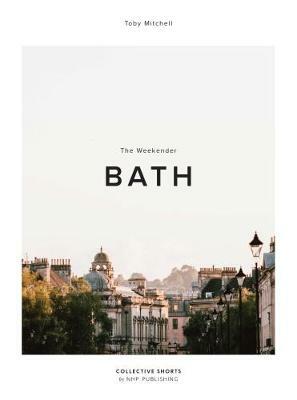 This series from photographer Toby Mitchel will start in the historic UK city of Bath. As Toby's current city of residence, he knows the greatest features of this UNESCO world heritage city. From the grand Georgian architectural delights, such as the Royal Crescent, delightful hidden streets, to the best spots for coffee in town, the book will demonstrate the spirit of the city through Toby's enigmatic photography. Whilst the flow of the book will incorporate the Friday to Sunday trajectory, the mixture of content will mean that a reader is both influenced by Toby's imagery of the city without explicitly having to follow a specific route but allow them to adventure at will. As the series develops we will potentially see the photobooks explore towns and cities in the Mediterranean and all the way to California, highlighting some of the best spots across the globe, whilst maintaining that clarity and earthy quality to Toby's photography. 1- Toby Mitchell has built a stylistic photographic portfolio that focuses on lifestyle and travel, here he consolidates this into his first book 2- Toby's inspiring photography has been featured in Cereal magazine and their travel guides, Monocle and Drift magazine. 3- Here the photographer explores a city in a new and unassuming way all through his fantastic imagery. This is a conceptual way of moving through a city whether you visit or enjoy the book at home.